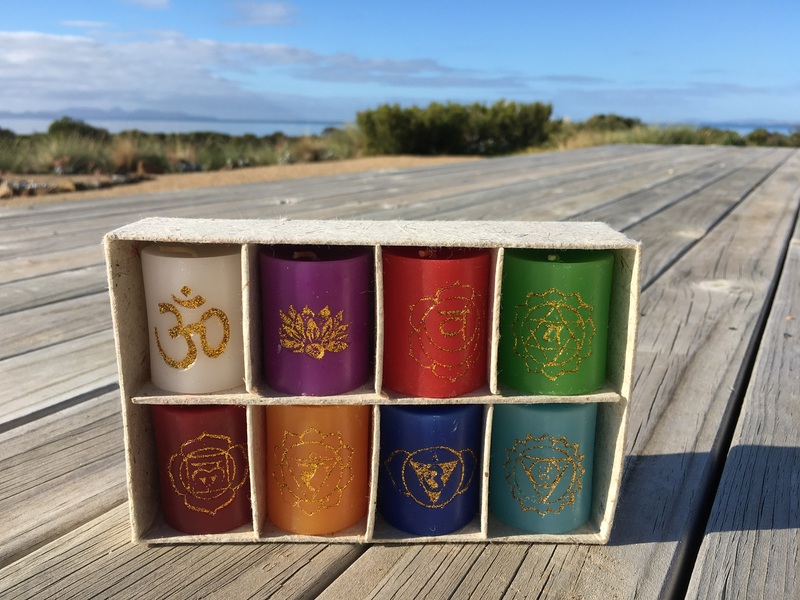 The first time I recently came across Om (top left) was in a beautiful set of coloured candles adorned with auspicious symbols, found at a second hand shop. Little did I know that soon I would see Om another three times in a short period. This was unexpected given the setting in rural Australia, although perhaps I should not have been surprised given the universal nature of the symbol. 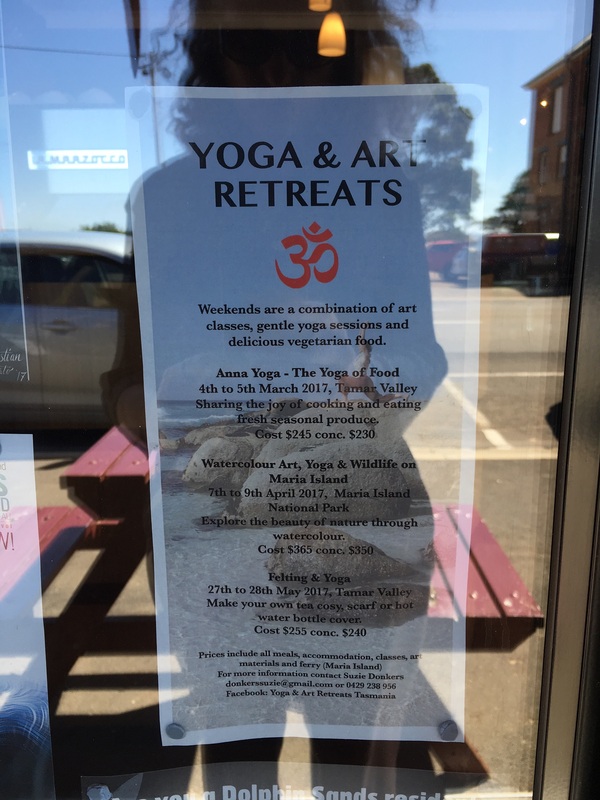 On the same day as finding the bag, I saw the Om (using the alternative spelling Ohm) symbol on a tshirt hanging outside a shop in Deloraine, Tasmania. Cosmic is a good word to connect with Om which is considered the sound that created the universe. There must have been some reason why I saw so many Om/Aum symbols in such a short space of time. It was like I was being encouraged to discover the nature of the relationship between Om and the five Hindu elements of earth, fire, water, air and ether. Given the importance of both concepts in the Upanishads, the mystical texts associated with the Indian Vedanta philosophy, as well as in Yoga, I would expect some connection between them. Om is also part of the iconography of Buddhism and Jainism, with Buddhism having it’s own strong relationship with the five elements. Jainism may have as well – I haven’t had a chance to investigate that religion yet. 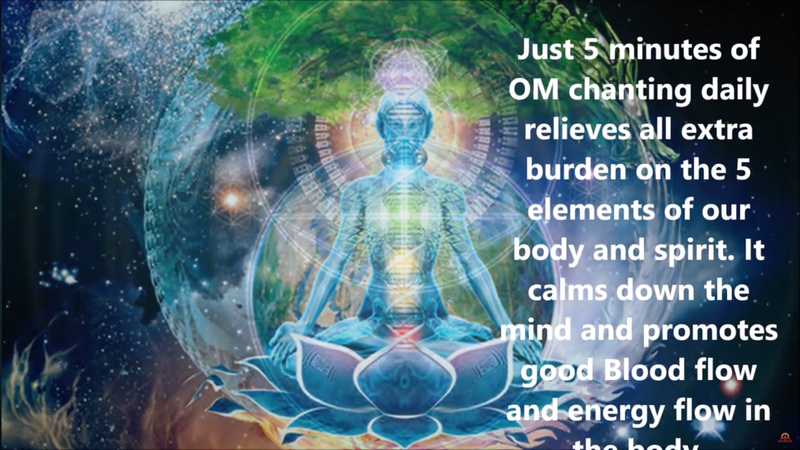 When searching on-line for ‘Om and the five elements’ the most striking ‘hit’ was a YouTube video on Transcedental Om meditation and the five elements. 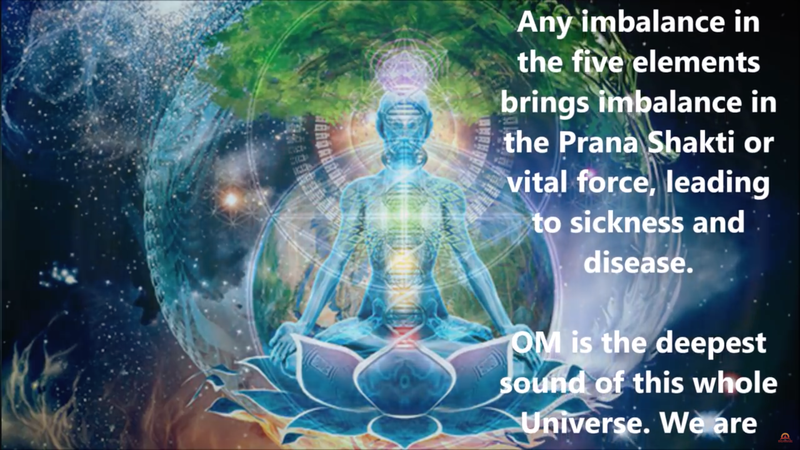 Three of the screen shots taken from the video (see below) outline the connection between the five elements and chanting OM. It touches on the relationship between the five elements and our health, as practiced through Ayurveda, the Indian science of medicine. Another connection that struck me was that Om and the five elements are different forms of energy.I also came across an interesting article on shaktima.org that described different mudras for the five elements. Each had an associated mantra that started with ‘Om’. I imagine that somewhere someone has written about these connections so I will keep on exploring. For that moment though I will leave you this tantalising glimpse into a fascinating subject, with the hope that it will spark further interest. A pop-up post if you like. I would love to learn more from people with deeper knowledge of the links between Om and the five elements who read this post. 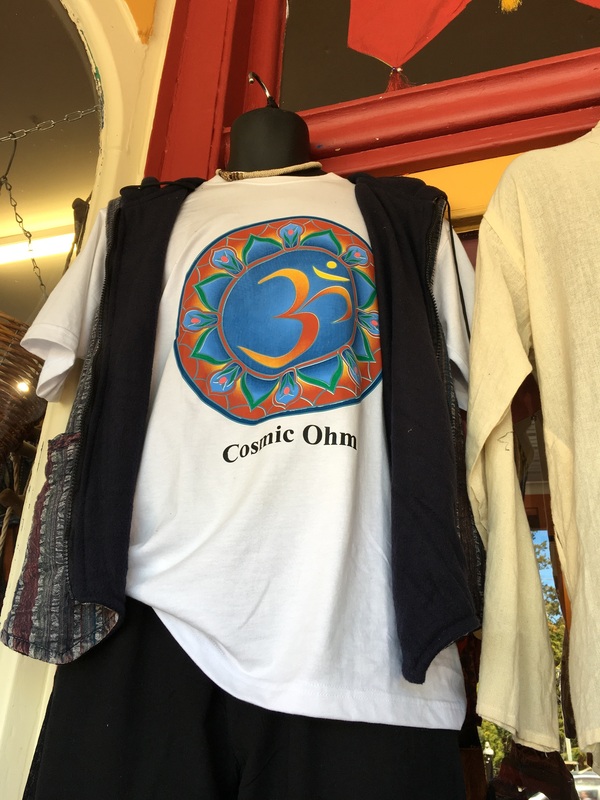 Postscript: To show this Om phenomenon is more than coincidence – my sister Ruth, who is the best commenter on my blog posts (as noted in most recent post ‘Searching for the elements‘), was wearing her Om t-shirt today. It’s the first time she has worn it this summer! The Universe works in mysterious ways. Another Om sighting, this time involving an Om clothing brand. 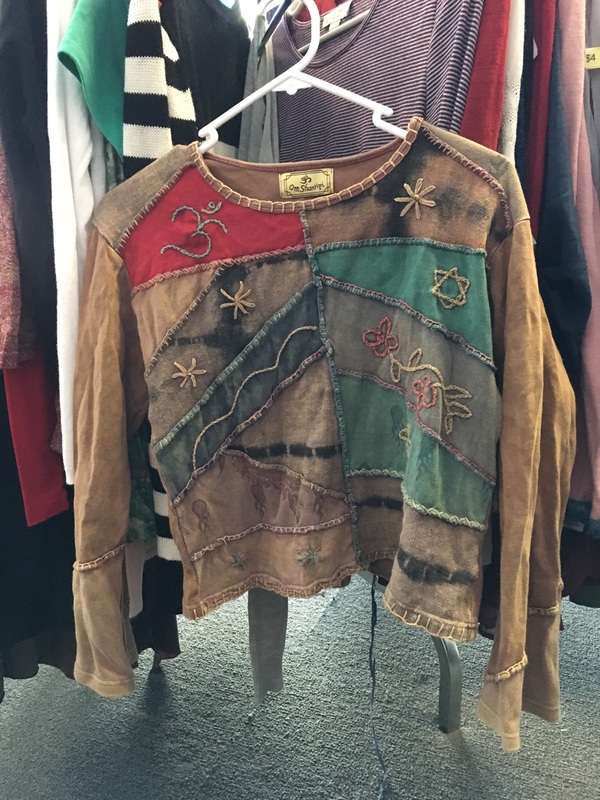 Seen in a second hand shop in Melbourne. 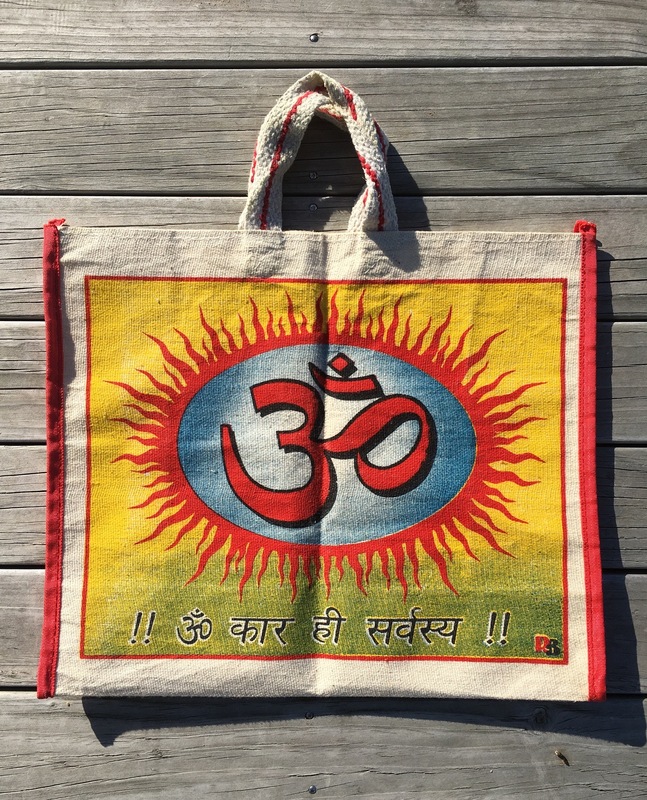 When you become aware…….Om is everywhere. This entry was posted in Aether/Space, Air, Earth, Fire, India, The five elements, Water, Wellbeing and tagged Air, earth, Energy, ether, Fire, India, Kundalini, Om, Water. Bookmark the permalink. I do like a pop-up post! Especially one about ‘Om’, and your reason for writing being based on a sighting. Or at least four sighting! I love hearing the word as chanted by monks with deep voices! Even though the post only skims the surface of this tantalising topic, it is one the Universe wanted me to share! 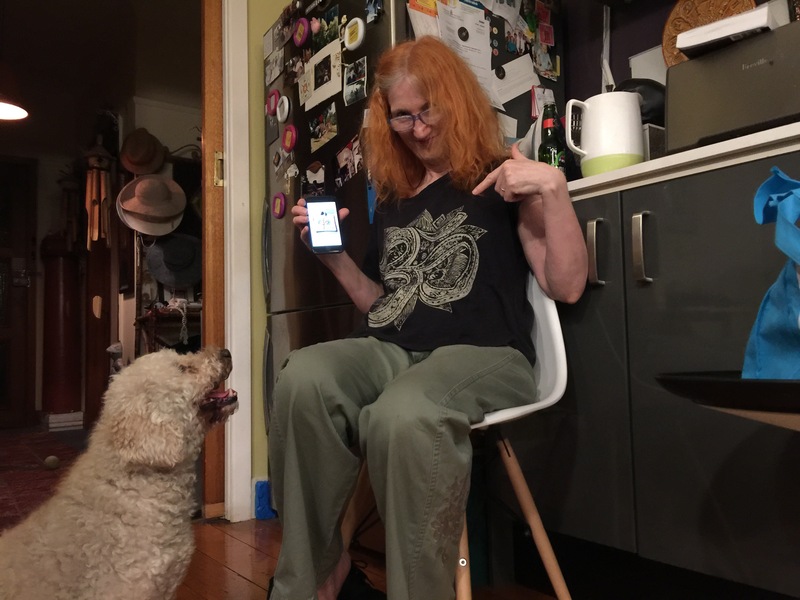 Such synchronicity that you were wearing your Om T shirt for the first time this summer the very day I hit ‘Publish’. 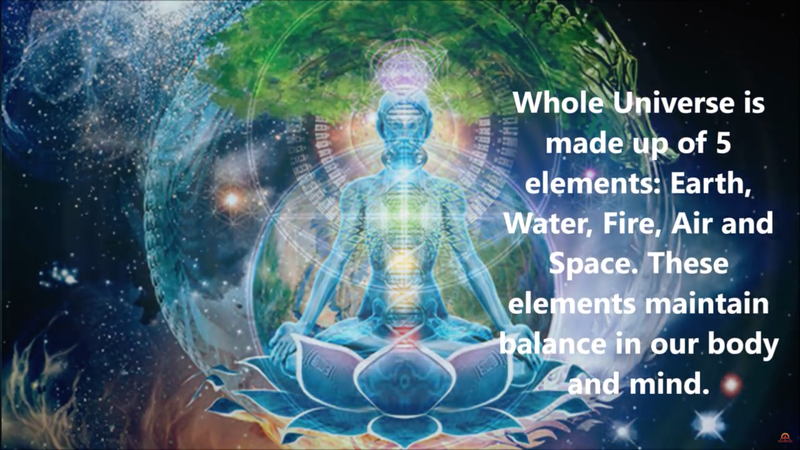 Based on my initial explorations I feel there is much more to be discovered about the connections between Om and the five elements. Those four sightings have opened a new area of investigation. Though I think I’ve seen he sanskrit for Om in Japan, I haven’t heard of any mainline sects chanting it, only the notorious Aum Shinrikyo sect. Do you know if Om chanting crops up anywhere in Japan, or indeed in China? An excellent question John. One that I will have to get back to you about the answer! As you have written about in Green Shinto, the stone shrine guardians in Japan such as the Komainu and the Nio statues, one with their mouth open and one with their mouth closed, combine to make the sacred sound of Aum. So far in my studies that is the only reference I have found. In terms of chanting Om, it is certainly practiced by Buddhists in Tibet. I will have to dig deeper to discover what the situation is in Japan and China.